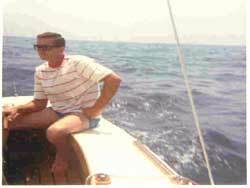 My first sailboat was love at first sight, it was a California Clipper, 20 foot day sailor made of plywood and hard chines built in 1954 in the Sausalito Ca. with a deep fixed keel. She was a beauty and very forgiving, I learned how to sail and felt invincible in those early years. The learning phase came with a cost, - in my haste to learn I failed to take into account how my actions and Captain Bligh approach affected the family. As it turned out, we all made it thru this unsettling phase and went on to enjoy many summers of sailing even though the spouse never fully recovered from my barking orders. The clipper was a fun boat to sail and running the gunwales under water and standing on the freeboard was exciting even if it was not the most efficient way to sail. It just felt great. Upon returning from a sail outside the breakwater a number of miles from Long Beach California, I spotted a huge ship way up north beyond Santa Monica. Knowing the ship was going for the same entrance into the harbor as I was I never doubted for a minute there would be a conflict so I just kept my course and watched the ship knock off the miles with incredible speed. One does not realize just how huge these things are when you look like a bobber on the end of a fishing line until you get close enough for the ship's horn to hurt your ears. As we headed for the breakwater entrance both of us not backing off, I began to doubt if I was going to live thru this day to tell my story to Coast Guard for having been derelict in my duties as a skipper of a small craft who was unaware I should not exercise my right of way over a powered vessel. As we came closer and closer to the entrance which is only 300 feet wide with monster size boulders on each side, my nervous system began to shut down and freeze up. All I could do was sit there, just as the ship's horn began to pierce my brain and the men standing on the bow leaning over the railing with their bull horn shouting down at me in some foreign language in a tone that was very threatening. I was passing in front of the bow barely two hundred feet, and was making my way thru the starboard side of the jetty entrance, hugging those boulders, hoping one did not snag my keel and send me to the bottom. Once I was safely thru the opening and was able to turn, I followed the breakwater wall at a safe distance, the voices on the bull horn and the ship's horn slowly started to diminish. I sighed a huge sigh of relief even as those deck hands continued to give me the most scolding of a lifetime. Ships moving at 25 knots take literally miles to come to a stop and wives do not like to be told what to do, - a very valuable lesson I learned and still haunts me to this day, I guess I will be in training forever here.